Located about 55 million light-years from the sun and spanning about eighty thousand light-years, NGC 4183 is a little smaller than the Milky Way. 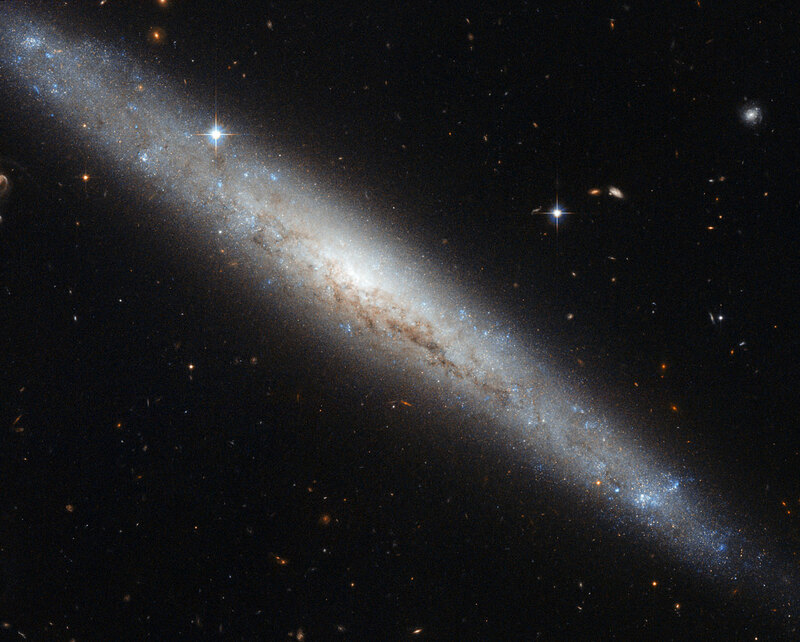 This galaxy, which belongs to the Ursa Major Group, lies in the northern constellation of Canes Venatici (The Hunting Dogs). NGC 4183 is a spiral galaxy with a faint core and an open spiral structure. Unfortunately, this galaxy is viewed edge-on from the Earth, and we cannot fully appreciate its spiral arms. But we can admire its galactic disk. The disks of galaxies are mainly composed of gas, dust and stars. There is evidence of dust over the galactic plane, visible as dark intricate filaments that block the visible light from the core of the galaxy. In addition, recent studies suggest that this galaxy may have a bar structure. Galactic bars are thought to act as a mechanism that channels gas from the spiral arms to the center, enhancing star formation, which is typically more pronounced in the spiral arms than in the bulge of the galaxy.